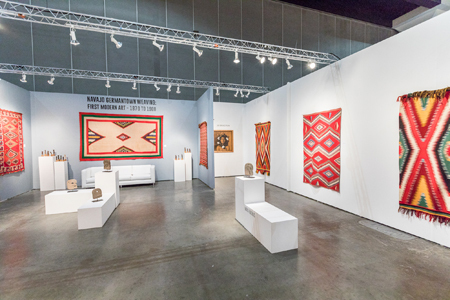 As part of the annual Antique American Indian Art Show, held in Santa Fe, New Mexico from August 14-17, 2018, textile expert Kim Martindale will present a stunning group of Navajo Germantown weavings. This extraordinary collection is one of the largest and rarest in the world. The special exhibition will include a variety of brilliantly colored, meticulously designed weavings made from 1870 to 1900. These striking artworks have a history as colorful as the patterns that adorn them. From the 1870s to around 1900, yarns spun and dyed at Germantown, Pennsylvania textile mills were sent to Navajo artisans in the Southwest. These richly hued threads of crimson, cobalt, and emerald, were spun into magnificent carpets and other items, incorporating ancient geometric designs, patterns, and embellishments. Commercial aniline dyed yarn was new and different from the natural dyes used by the Navajo weavers. It also eliminated labor-intensive processes or shearing sheep, spinning thread, gathering natural pigments, and more. The vivid coloration of the threads were embraced by indigenous artists, who transformed the brightly colored yarn into so-called “eye dazzler” weavings. Various factors contributed to the cessation of Germantown Navajo rugs, and very few of these items exist today on the market. Seeing these visually captivating, historical artworks in person is a rare opportunity.